Hello again...Life has pulled me away....It is so hard to balance work,home, and play. I plan to start posting again. This is me sticking my toes in the water before taking the full plunge back. I will be back with art,life, etc. Please check back and see me. I just found this blog called Pieces by Aideen and she is having a great giveaway for some cute fairy goodness. Hop on over and check it out!! Hi everyone! It's been a long time since I have posted or created anything. I am getting back into creating and have had some new visitors, so I figured I'd better bring this blog up to date. I just did my first ATC swap and it was lots of fun. I will post a pic of what I made soon. Life got in the way of my creative endeavors, but I am trying my best to get back to it. Please keep checking back to see my new creations unfold!! Well it looks like this is the week to share giveaways. One of my online art friends from Etsy is hosting yet another awesome giveaway for 250 custom business cards. She has the wonderful blog ArtSnark's Artifacts. Please take a hop on over and give it a look. She does some wonderful artwork!! 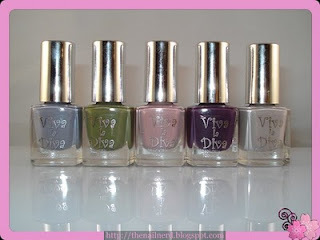 One of the nail blogs that I visit The Nail Nerd is having her first giveaway on some awesome polishes. Just click on the name and it will take you right there. She has a great blog go check it out!!! Happy New Year everyone!!! I hope everyone has had a safe and happy start to the new year. Very rainy here which is supposed to be good luck. Here's my New Year's mani. It reminds me of streamers and confetti. I used Sally Hansen Black Diamond as a base with silver paint squiggles, white dots, and silver glitter accents on top. Enjoy! !